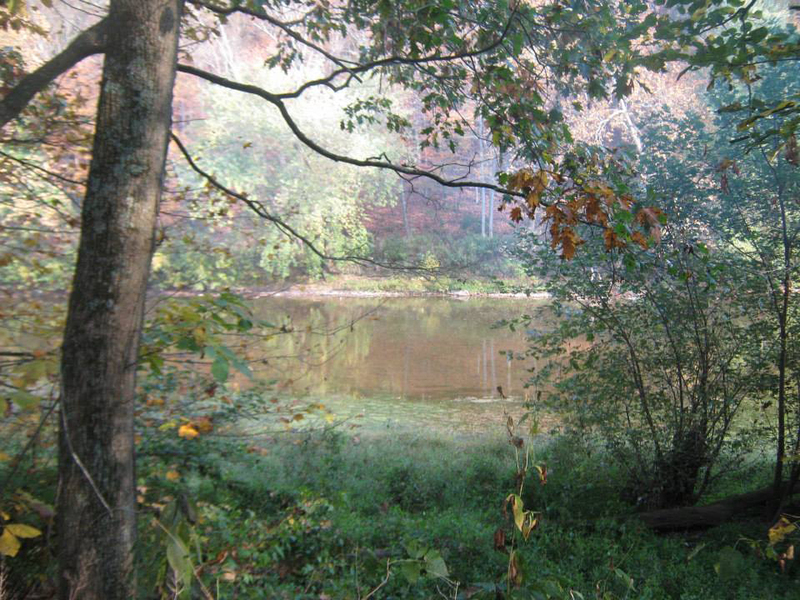 View of the Raystown Branch of the Juniata River from a campsite. 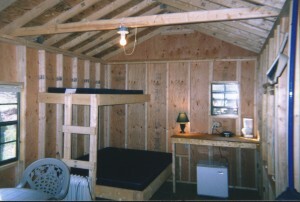 Interior of Our 2-room Cabin. 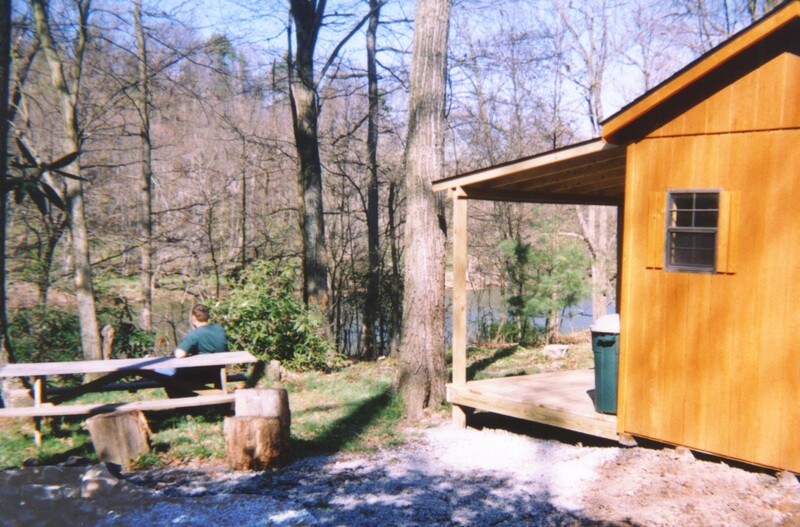 Amenities: The 30 acre campground is located along a mile of the largest tributary of the Juniata River in a heavily forested, private, and quiet setting - Fishing, birdwatching, bycicle trails nearby, canoeing, kayaking, nature walks, tubing, and river wading or swimming on-site - Five riverside Camper Cabins - Riverside campsites for tents and small camper vehicles - No-water or electric hook-ups - Central bathhouse with hot showers and toilets - Pavilion with group fire ring - All campers must bring bottled water for drinking and cooking - Firewood available - pets permitted except for dangerous breed dogs. No parties or large gatherings unless preapproved. - RVs or towed Campers limited to no more than 24 feet in length - dump station - Primitive riverside seasonal sites available for yearly lease from $375 - Great place to stop and camp for overnight river canoe and kayak trips while traveling the Raystown Branch of the Juniata River Water Trail. Reservations and Deposits: Call 814-730-5054 or email Juniatacamp@gmail.com. A 20% deposit is required to hold reservations. Deposits will be returned if cancellation is within 7 days. Check-ins and Check-outs: Check-in time is 1 PM. Check-out time is 11 AM. Weeknights are Sunday through Thursday. Weekends are Friday and Saturday. Camper Cabins: Four (4) 2-room rustic riverside camper cabins and one (1) rustic 3-room riverside camper cabin: No toilets or showers in cabins but all cabins are located within a short walking distance of the central bathhouse - All cabins located on shaded and forested sites - Visitors must bring bottled water for drinking and cooking as well as sheets, pillowcases, and bedding. Nonpottable water at cabins. 3-room Cabin: Sleeps 5 to 7 with two doubles and three singles with mattresses - partial air conditioning and heat - Weekly $285 (Friday to Friday), and nightly $65 - two night minimum for weekends and holidays - kitchen sink and running (non-potable) water, large fridge, microwave, coffee maker, utensils and dishes - roofed porch - furnished with dining table and chairs - fire ring - picnic table - charcoal grill. 2-room Cabin: Sleeps 4 to 6 with two doubles and two single bunks with mattresses - Weekly $245 (Friday to Friday), Nightly $45 - No holiday or weekend minimums - roofed porch - furnished with dining table and chairs, small dorm style refrigerator, coffee maker, floor fan and space heater - no running water - fire ring - picnic table - charcoal grill. Regular Campsites - Riverside primitive campsites for tents or small RVs and camping trailers. RVs and trailers limited to 24 feet in length - Monthly $425, Weekly $140, Nightly $25 - No holiday or weekend minimums - no hook-ups - Sites have fire ring and picnic table. A Privy or the central bathhouse is within walking distance of campsites. 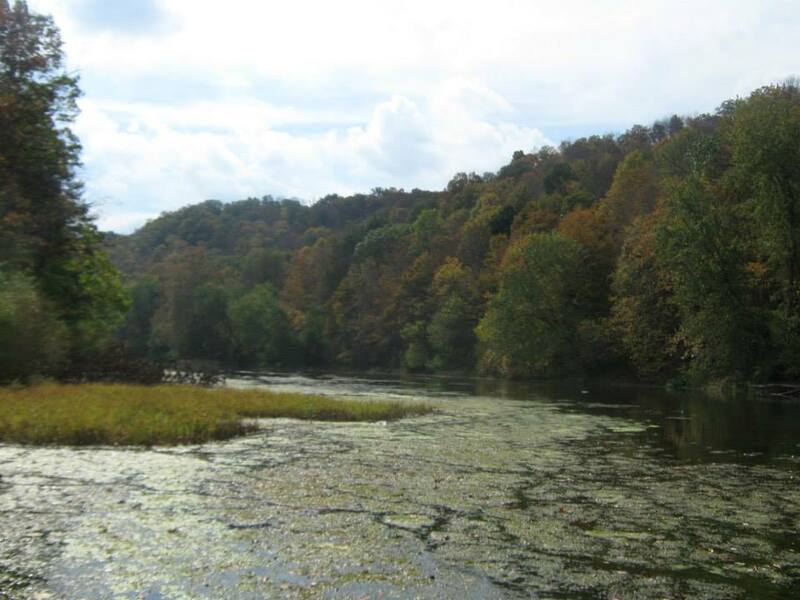 Large Group Campsites in Secluded Area - Riverside sites with easy river/canoe access - Weekly $180, Nightly $35. Ideal for youth, scout, and church groups. Pavilion - 20' x 16' - picnic tables - fire ring - charcoal grill - short walk to the bathhouse - overlooks river - ideal for family gatherings - $40 per day for outside groups. View of the Raystown Branch of the Juniata River running by the campground. The Campground Road View of the Raystown Branch of the Juniata River from a campsite. Driving directions. 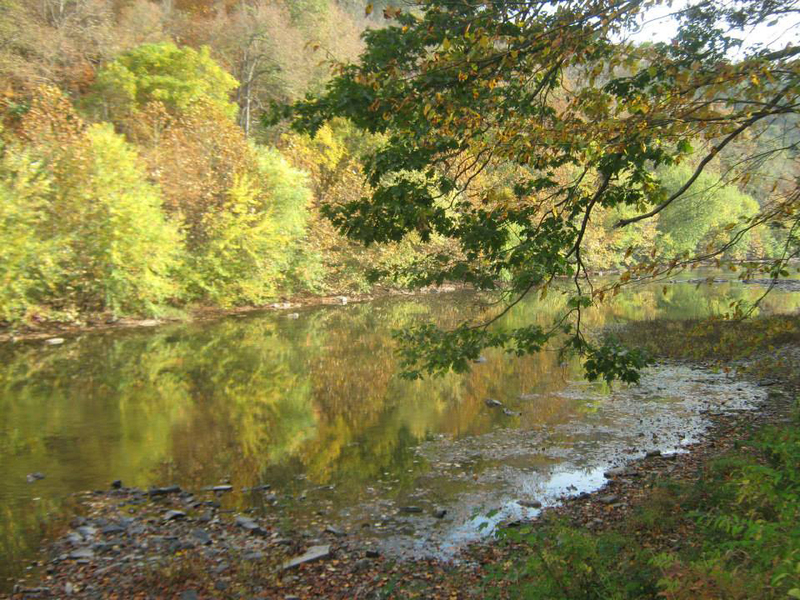 The campground is located in a secluded location on the Raystown Branch of the Juniata River about 4 miles northeast of Everett, PA. 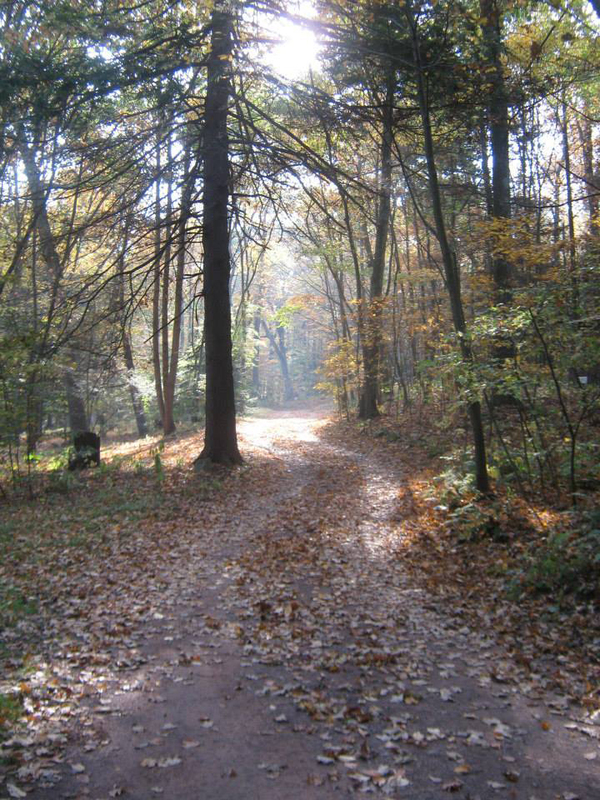 The 911 and mailing address is 190 Campground Rd, Everett, PA 15537. From Breezewood:(Tpke Exit 12) take Route 30 west 1/2 mile and turn right onto State Route 1011/ East Graceville Road. 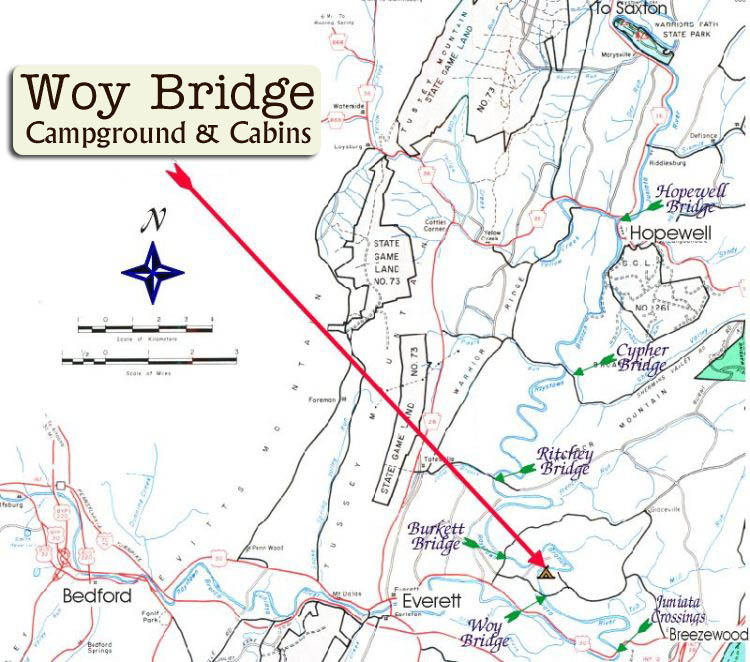 Go north for 2 miles and turn left at the "Y" onto State Route 1010/ Woy Bridge Road. Go west on SR1010/Woy Bridge Road for 2.2 miles and turn right onto a gravel/dirt road located between a house trailer on the right and a farmhouse on the left - At the turn is a large yellow state sign noting the bridge height clearance of 13'7" ahead - after turning onto the gravel/dirt road (T464) go about 50 yards and turn left at the top of the grade onto Campground Road - the gate is 200 yards ahead. From Everett/Bedford: From the Shell gas station on Route 30 just East of Everett, go two miles (2) miles east on Route 30 and turn left onto State Route 1008/West Graceville Road – Go ¼ mile and turn right onto State Route 1010/Woy Bridge Road – Go 2 miles (you will cross Woy Bridge) and turn left after going another .7 miles onto the gravel/dirt road located between a house trailer on the right and just past a farm house that is on the left – after turning onto the gravel/dirt road (T464) go about 50 yards and turn left at the top of the grade onto Campground Road – the gate is 200 yards ahead.